The portion lableled B skips around the pole at u equals 0, the portion labeled A is on the real axis and stretches from negative infinity to infinity. The slightly off-screen semi-circle labled C is the return path that in this case integrates out to zero at infinity, (Jordan's lemma and whatnot if you're into the details). We kept the pole outside of the contour, so we know at the end of the day, the entire integral has to wind up being zero, (Cauchy theorem?). That means that A is equal to negative B. A is pretty much our original integral that we didn't know how to to do in the first place, so maybe B will be easier and it is (sort of). 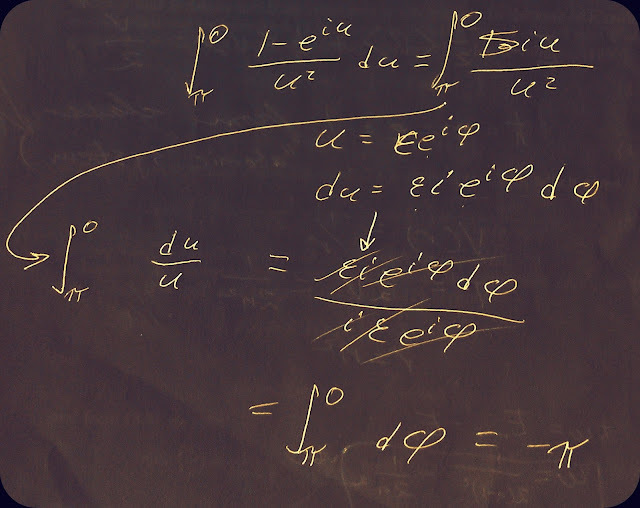 We've just re-written cosine as the real part of e to the i times u power, which is true, (check out Euler's formulas). This still isn't exactly tidy, so the next step is to remember that our little jig around the pole was small. Then, we can approximate the exponential as it's Taylor series. Things are getting better. Now, we're down to an integral that just has powers of the variable. Since we're integrating around a semi-circle, the next step will be to represent u as an angular variable. We've re-written u as e to the i times phi. I know, I know, I just put the exponential back in that I used my Taylor Series to get rid of. Don't worry, though, it will go away almost immediately as it gets cancelled by the new differential for the new variable of integration phi. Finally, we're just left with the very simple integral in the last step and we get that our original integral along A which is equal to negative B, (the integral we just did), is in fact pi. The two keys that should have pointed me iand everyone else in the direction of contours are that the integral extended from positive to negative infinity and that the integral involved a trigonometric function to begin with. Physics professors, (at least mine), spend a lot of time saying "Don't memorize the formulas. Look them up." They only kind of mean it though. The big kids, (professors), have all the tools used above memorized including the Taylor series for the exponential, Euler's formula, and the fact that they're headed into the complex plane in the first place. I've been trying to perfect getting paper to look like a chalk board. It's not much, but you gotta have a hobby. In today's post, I thought I'd nailed it with pictures 3 - 5. Elaine said not so much. She thought picture 2 was the way to go. Any thoughts?